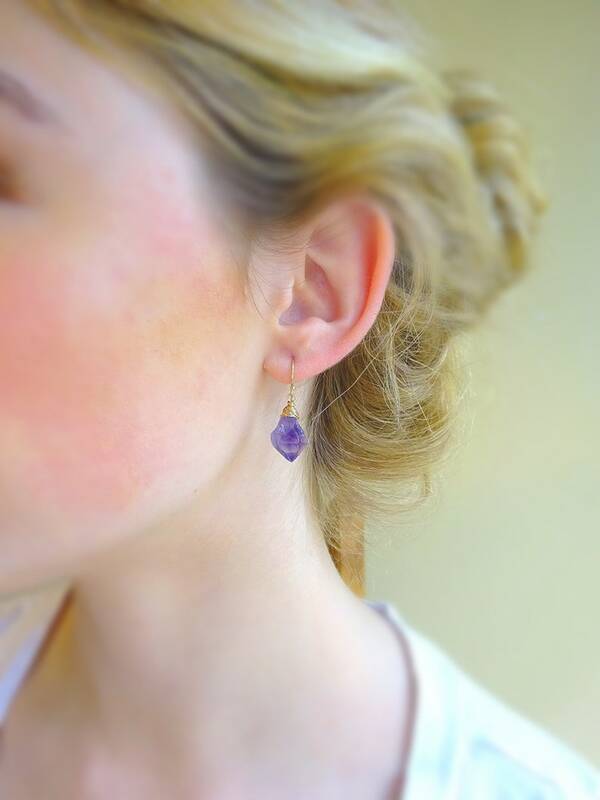 ~ FREE DOMESTIC SHIPPING On all orders of $45 and up ~Naturally beautiful in their unpolished state, raw amethyst points are elegantly wire wrapped and suspended from minimal French hooks. Earring length is approximately 1" from the top of the hook to the base of the stone. Ear wires and wire wrapping are all 14k Gold filled, rose gold filled or sterling silver, depending upon your finish selection. All metal finishes are heirloom quality, NOT plated alloy or base metals, nickel free and safe for all wearers. Your jewelry will never chip, flake, peel or cause skin irritations or discoloration. These are intended to be worn and enjoyed for a lifetime. PLEASE NOTE, these are all unique stones with beautiful shape variations that make them highly sought after, each stone WILL BE DIFFERENT, all of them are amazing! Your earrings will arrive gift boxed and ribbon wrapped, along with a storage bag, care instructions and a jewelry cleaning cloth.